Happy National Caramel Apple Day! 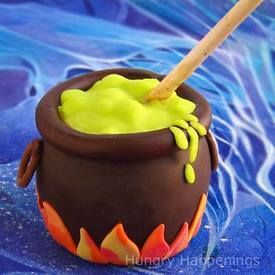 Our witch themed party inspired me to transform a chocolate dipped caramel apple into a cauldron complete with flames and bubbling brew made out of modeling chocolate. I made my own caramel apples and pushed the stick into the apple at an angle so that it would look like a large spoon stirring the cauldron. I am very pleased with how the final cauldron turned out even though I know I could have made them even more elaborate by sculpting some ingredients for in the pot, like eye of newt, and wing of bat, but my time is limited right now. My list of things to do before our party doesn't seem to be getting any shorter (don't know how that is possible, but it sure seems to be the case), so I have to get back to work. Enjoy the recipe.